DRUIDS continues designing and developing innovation for the production and processing of wire, constantly developing new technologies and equipment, enabling the transformation and improvement of the wire producing industry. DRUIDS continues the long tradition in the wire equipment development and manufacturing, led by Xavier Ayesa, started in 1987 with the foundation of AUTOMAT INDUSTRIAL. DRUIDS development of technologies and equipment is focused in the scientific study of the production of wire and metals transformation processes, including the wire drawing, thermal treatments, galvanizing coating and coil packing. We develop, manufacture and supply complete factories to produce ferrous wires. The first production step is the steel wire transformation through drawing the wire rod into wire for further processing, such as thermally treating and zinc coating. The best and most modern process to produce wires is the high performance roll drawing developed by DRUIDS. 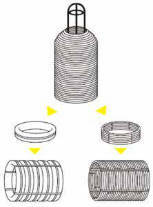 The galvanized process is the fused zinc wire dip during a determined time. During this coating a chemical reaction is produced between the metals, creating an adhered metallurgical coating with diferent composition metal sheet layers. The objective is only to protect metal against corrosión. After a galvanisation, during the corrosión process zinc is used to protect metal and in this way wire oxidation is avoided, enlarging its usfel life. DRUIDS supplies full installations with traditional technology and also new clean technology evolution, more up to date. Splitting big wire rolls into 25 to 50 kg units approx.